Today's the day! 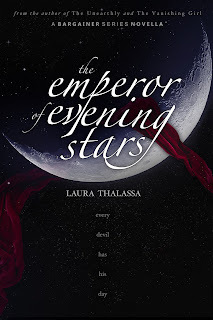 The Emperor of Evening Stars (The Bargainer #2.5), Des's novella is finally out! You can find it on Amazon here. Calling this book a novella is a bit of a misnomer. At 55,000 words (roughly 200 pages) it's more like a short novel. I can't begin to tell you how much fun I had sharing all of Des's past with you. The book spans from his earliest years, up to where book two leaves off. You'll get to see old scenes given new life from the Bargainer's perspective, as well as never before seen scenes told by the King of the Night. Right now the print version is not yet available, but it will be in another couple weeks. At this point in time, there will be no audiobook for this book, so you'll have to read it the old-fashioned way. I hope that in reading Des's book, you fall in love with him all over again, just as I did.